You never know what treasures you might find on a trip to the thrift store. Sometimes there’s nothing at all to grab your interest, but other times . 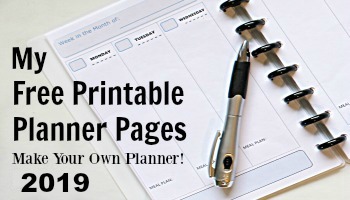 . . well other times you may just stumble across the perfect find at a great price. And that’s what keeps lots of us second-hand shoppers checking in to our favorite spots regularly. Each trip is a new adventure! One of my recent fun finds was a little set of bread dipping oil dishes. I always enjoy the bread with dipping oil and spices at my favorite restaurant, Carrabba’s. Only on special occasions do we go there but when we do, oh man is the food great! 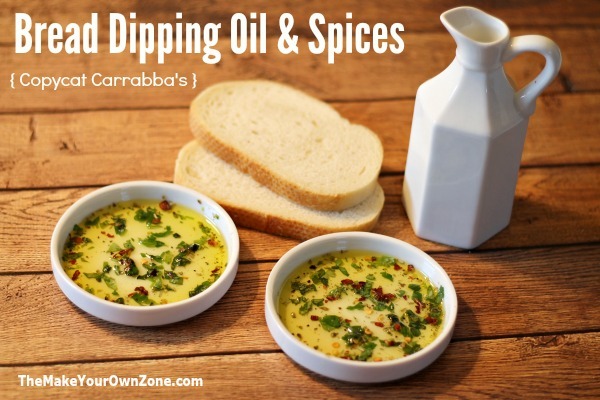 And I’ve always wanted to try a homemade copycat version of Carrabba’s dipping oil and spices for bread. My thrift store dishes for a couple bucks gave me the perfect opportunity to give it a try and make my own! After some trial and error I settled on a method that works well for me. 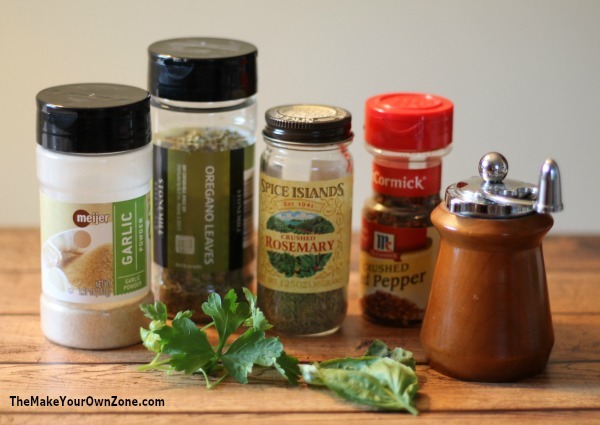 I use a combination of a couple fresh herbs with the dried spices. This gives the mixture some fresh flavors, but also lets me to use some of the more frugal spices in my cupboard too. I also decided not to do a make-ahead spice blend mixture either. I found it just as easy to add a pinch of each spice to each dish when it was time to eat. If I ever change my mind on that, I’ll just use equal amounts of each spice in my blend. 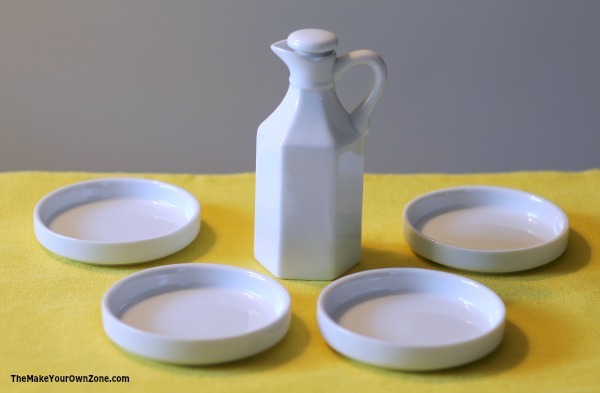 Even if you don’t have a set of dipping oil dishes (but keeping checking your local thrift store!) you can do this at home with any little saucer-type plate that you can sprinkle some herbs and spices onto and cover with a bit of olive oil. Very finely chop a few leaves of parsley and a few leaves of basil. 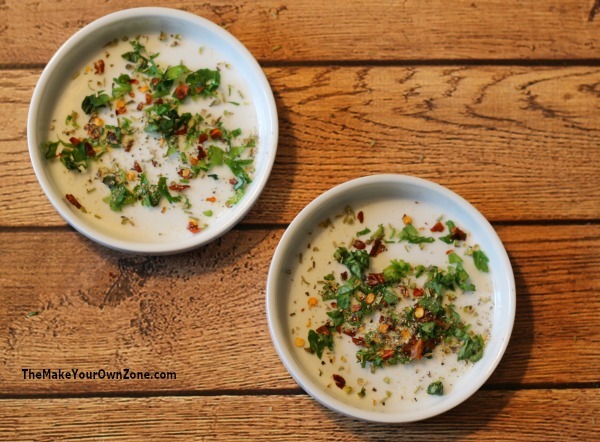 Sprinkle the chopped parsley and basil into your dipping dishes. Now, into each of the dishes you will add a pinch, or a small sprinkling, of each of the dried spices (the rosemary, oregano, red pepper flakes, garlic powder, and black pepper). Pour some of the extra virgin olive oil over the spices in each of the plates. 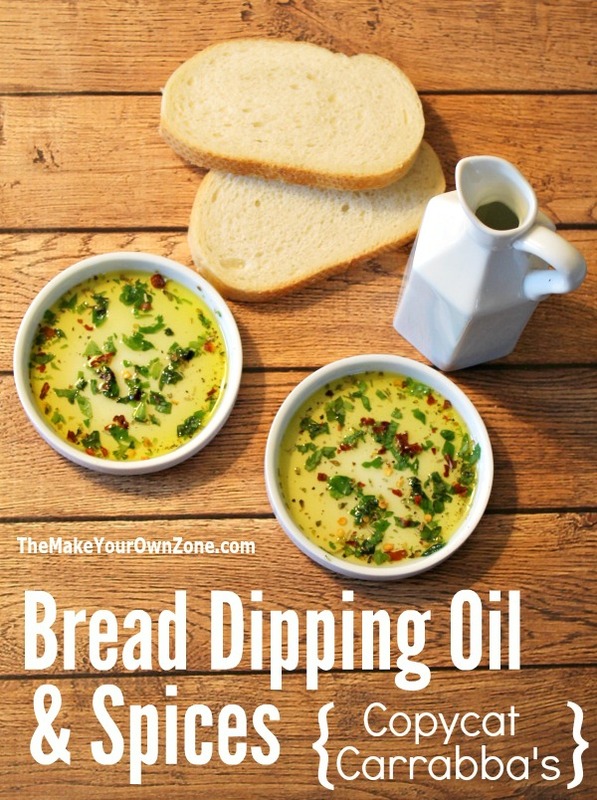 Dip your bread and enjoy! ~ If you don’t have fresh parsley or basil, you can substitute dried parsley or dried basil too. ~ If you would like to make the spice mixture ahead of time, I would suggest blending equal amounts of each dried spice (for instance one teaspoon of each). ~ If you have fresh rosemary or oregano available, you can of course use that instead of dried if you wish. I think the key is just to have at least a couple fresh herbs to give the mixture good flavor.